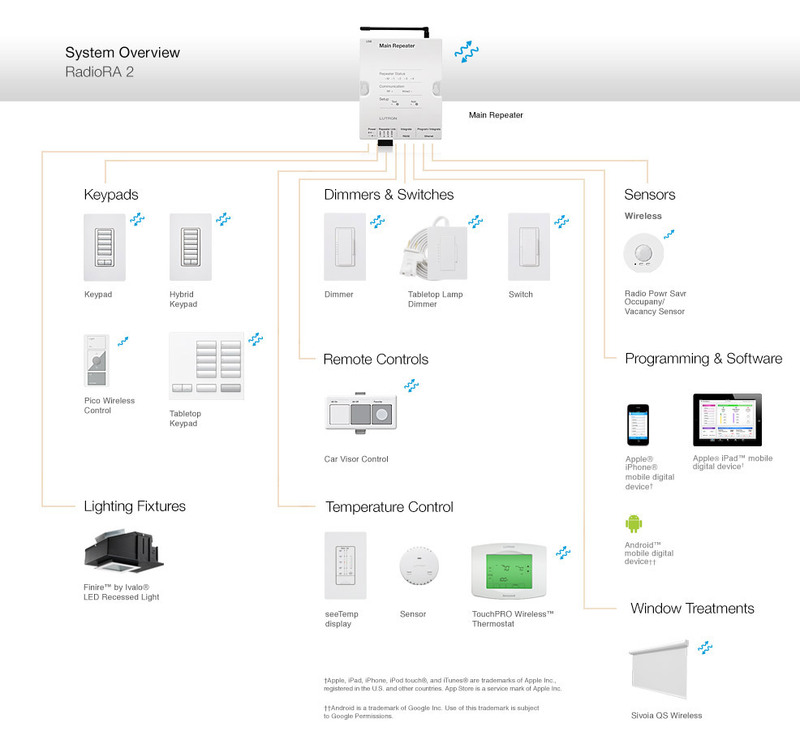 The diagram above provides an overview of the components that constitute RadioRA 2, as well as compatible Lutron products. You can refer to the categorized list below to find a complete list of components with more detail about select products. The GRAFIK Eye QS main unit may be used with the RadioRA 2 system to control single rooms in your home. The RadioRA 2 system uses the following dimmers and switches for reliable, convenient light control. Turn the lights on or off from your car with a car visor remote. Control the RadioRA 2 system at the touch of a button with programmable, easy-to-use keypads. Energy-saving occupancy/vacancy sensors can be used to reduce operating costs. RadioRA 2 uses the following interfaces for convenient, reliable light control. The RadioRA 2 system uses the following devices for convenient control of temperature from keypads, mobile devices and the timeclock.